It was so much fun and my mom loved it so much that I had to make something equally nice this year. 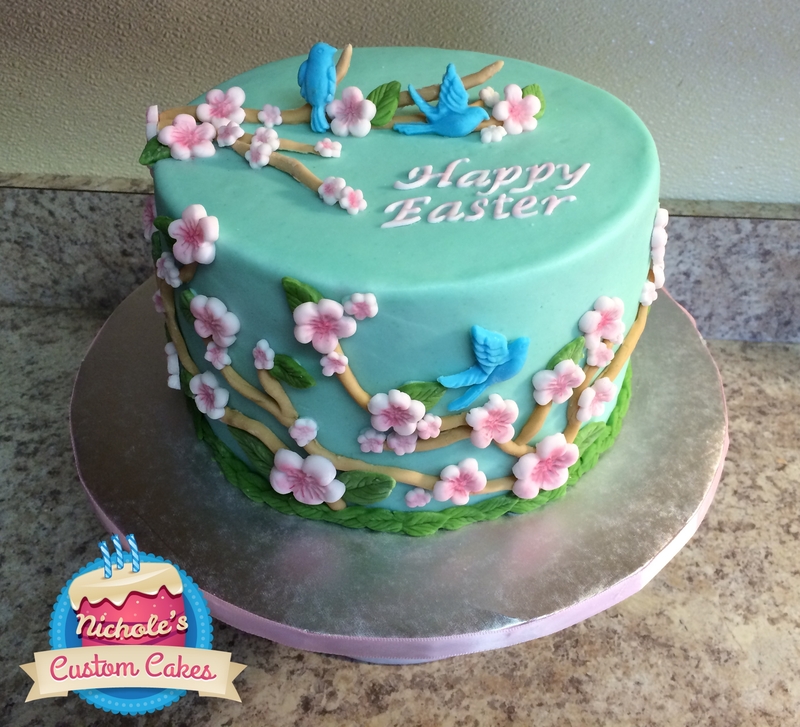 At first I wanted to make an Easter basket cake, but then I saw this project on Wilton.com: http://www.wilton.com/idea/Bluebird-Bough-Fondant-Cake and fell in love with it! I had been eyeing up their collection of gum paste/fondant molds for quite some time now; this was the perfect excuse to buy one and get to work. 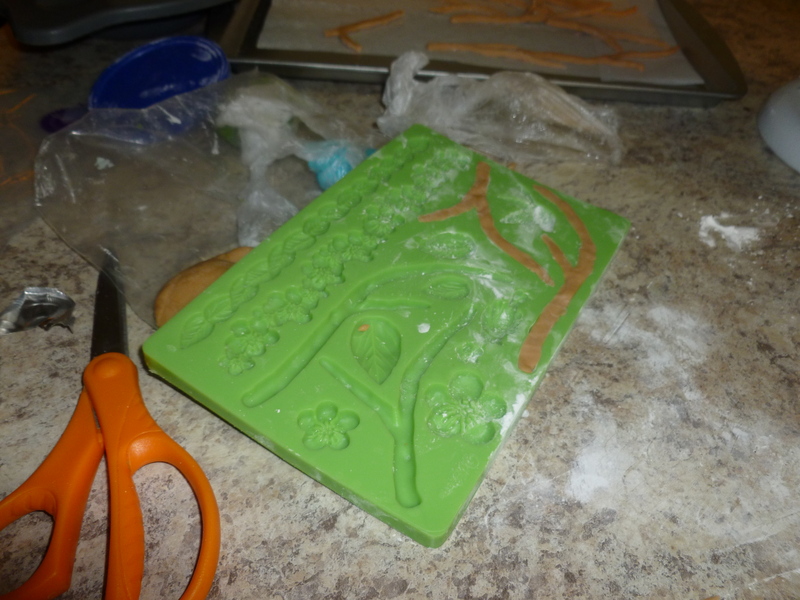 The FIRST thing to do, obviously, was to purchase the nature mold and start making decorations. Armed with a 50% off coupon, I got it for around $5-6 at Michaels Arts & Crafts. All the molds are also available on Wilton.com and on amazon.com. Choose your poison! I also researched strawberry cake recipes. I decided on this one by Smitten Kitchen. It’s a three-layer cake from a book called “Sky High Cakes” and it sure did make a lot of cake! 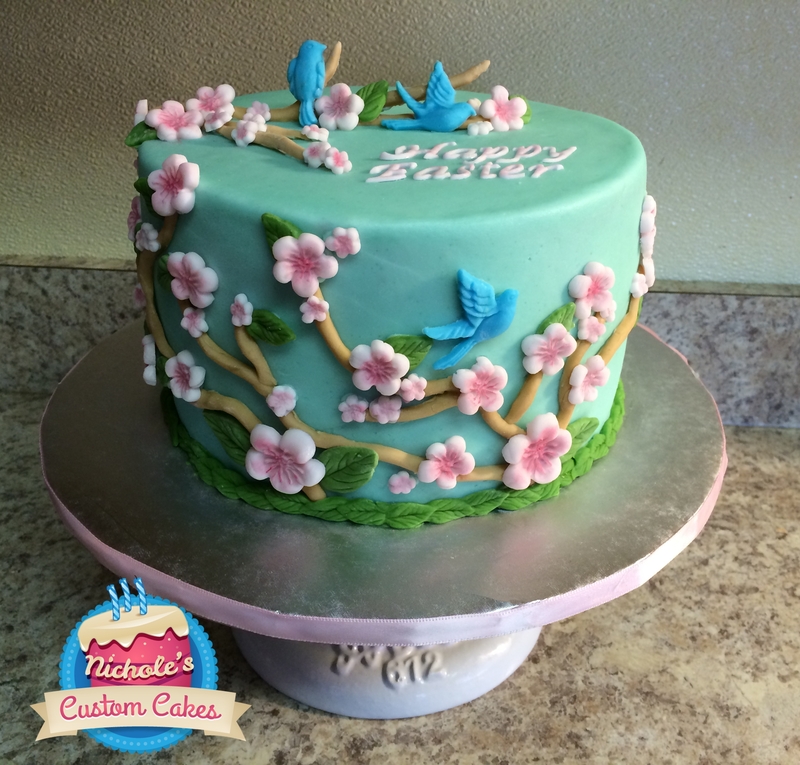 The beauty about working with fondant is that you can start things ahead of time. Well ahead of time. Easter fell on April 20th of this year. I started my decorations around the first weekend of April. 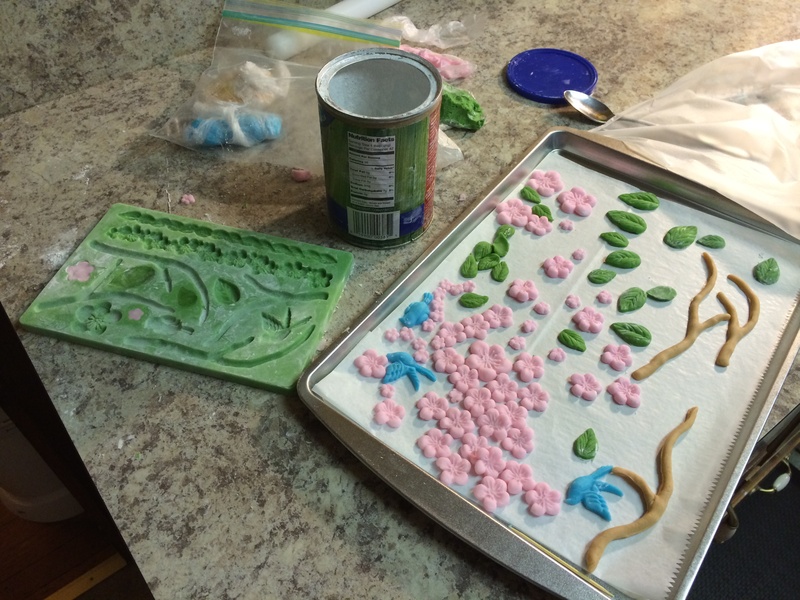 I dyed fondant in very light pink, moss green, robin’s egg blue and light brown. Then I got to work. Using the molds takes a little getting used to. 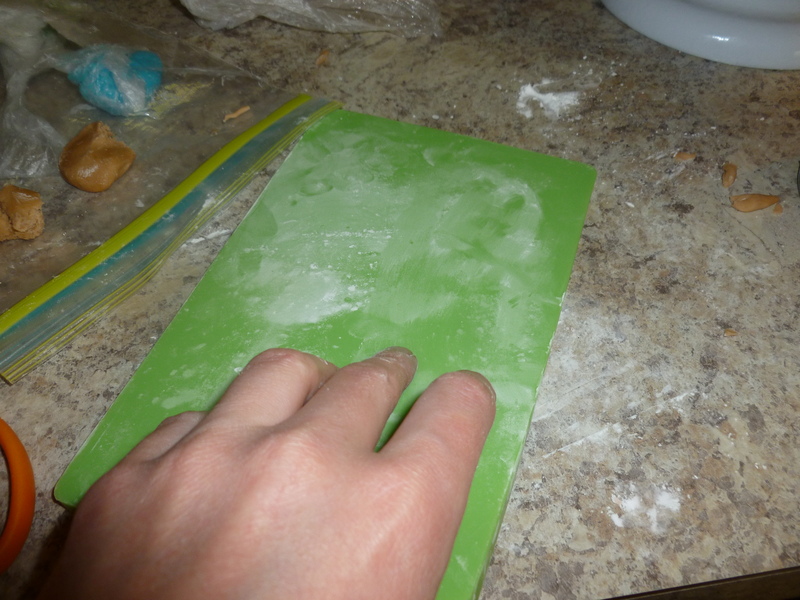 Dust with corn starch, then tap out the excess. 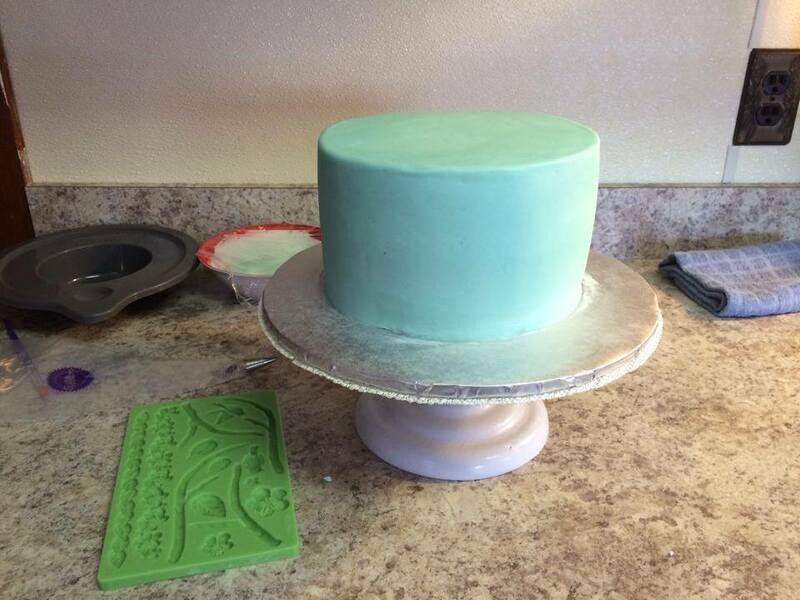 Press a small amount of fondant into the cavity and let it rest a minute or so. Then, turn it over and kind of tap it out. But that’s just for the single leaves and flowers. I let the birds rest for several minutes. Otherwise, they lost their shape easily. 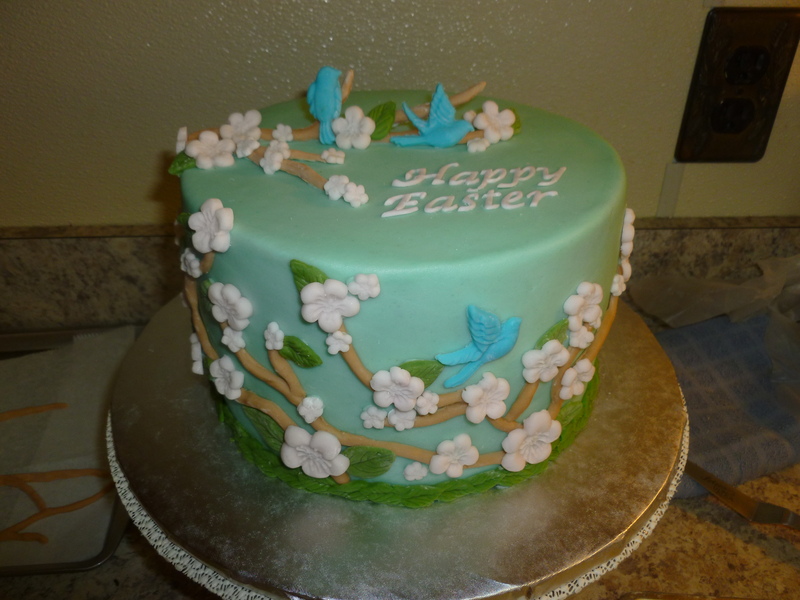 I should add that you HAVE to make the branches that stand up on the top of the cake and the birds ahead of time. If you wait until the last minute, they’ll be soft and it just won’t work. A note about the BRANCHES and the wings of the birds. You see how the branches go off in different directions? All I did to solve that problem is to just kind of squish together where they intersect and hope for the best. I’m not sure what other people do, but that is what worked for me. Since the branches around the sides and the leaves for the border have to be soft so that they adhere to the round sides of the cake, you can’t make those ahead of time. You just have to wing it when the time comes to put the cake together. While I was feeling so productive, I also used my Tappits (I’ll make another post about those later) to make the words Happy Easter. With the cake baked and in the freezer and the decorations made, all you can do is wait until it’s time to make the rest of the cake. 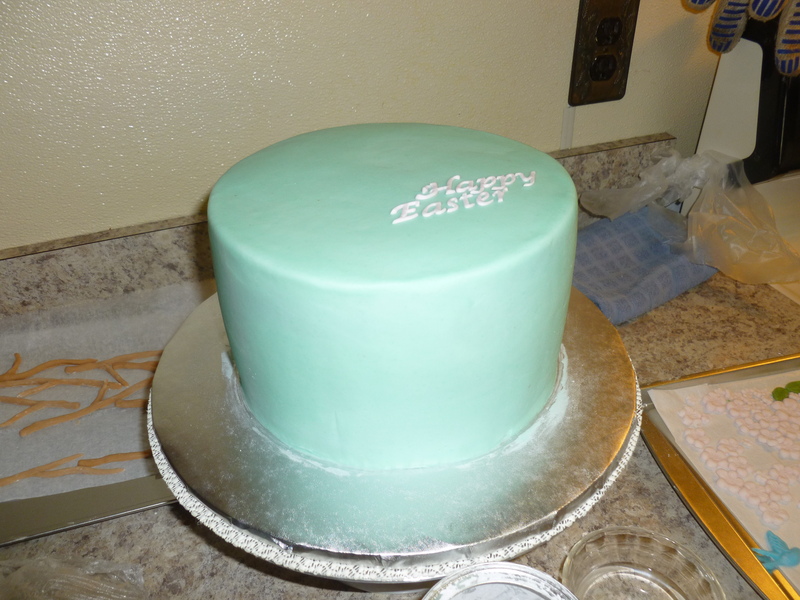 My time line for this cake was crumb coat on Friday night and cover and finish on Saturday. Eat it on Easter Sunday. 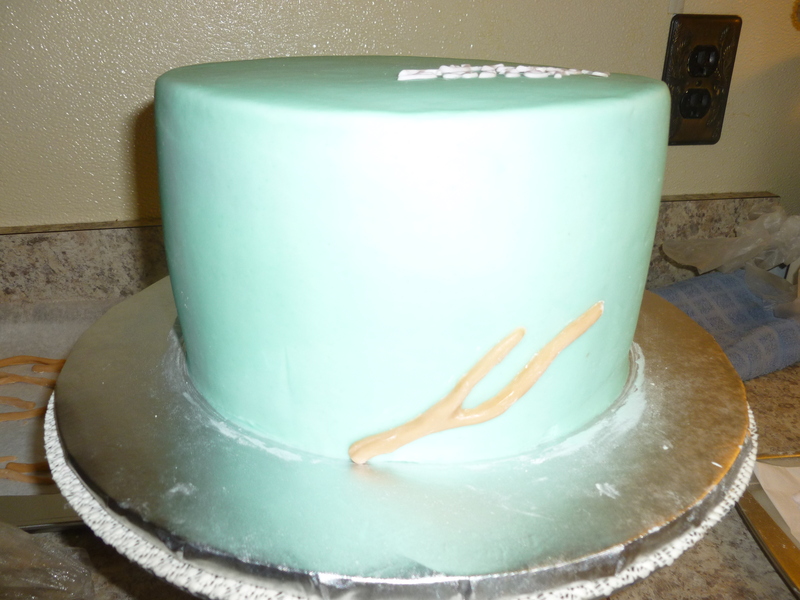 This is my cake after crumb coating and covering with light sky blue icing. The instructions call for covering the cake with fondant, but I didn’t find that to be necessary. Buttercream is more delicious, anyway. I ALWAYS make sure I clean my cake board after I have iced my cake. I can’t tell you how it gets on my nerves when people don’t clean their cake board. All it takes it is a damp paper towel and a dry paper towel. Wax on, wax off. 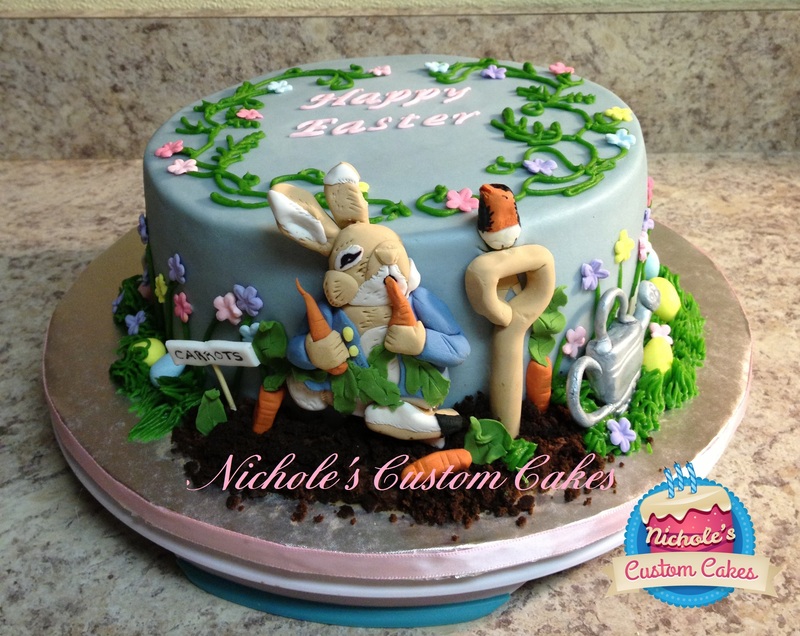 My next step was to add the message (Happy Easter) to the top of the cake. This isn’t usually how I do things and it was a mistake — I ended up moving them to a better place later on. And then I had to re-smooth my icing. Fail! Then it was time to make the branches for the sides of the cake. I dusted my mold, and started to make some branches. It took some playing around and re-arranging to figure out how I wanted them to be. The pictures on the website aren’t exactly clear and I already decided it wasn’t going to look EXACTLY the same. Fill the cavities, let it rest. 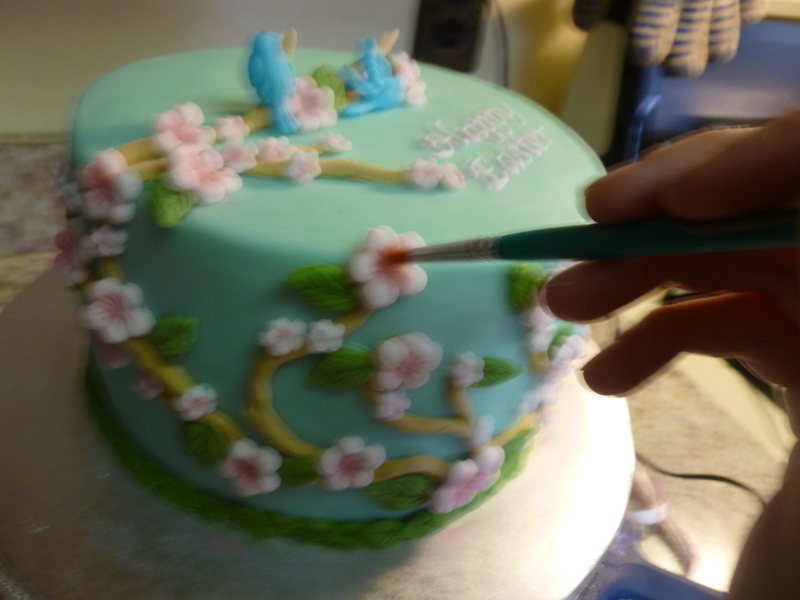 After I set up all the branches, it was must a matter of applying the flowers and leaves with buttercream. I use buttercream instead of water for the heavier decorations because it will hold it better. 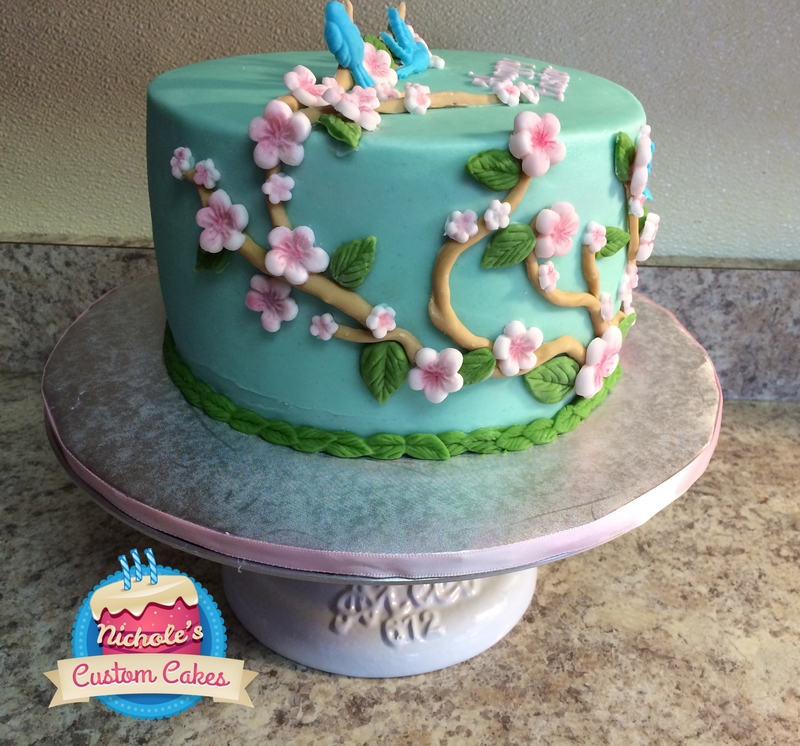 I also set up the hardened branches and birds on top of the cake. I had to improvise, because, like I said earlier, I couldn’t exactly make out how they had it on their cake. After all the flowers and leaves were added and I moved the letters to a better spot, I made the border. At first, I dusted it a lot and that worked, but they looked awful. 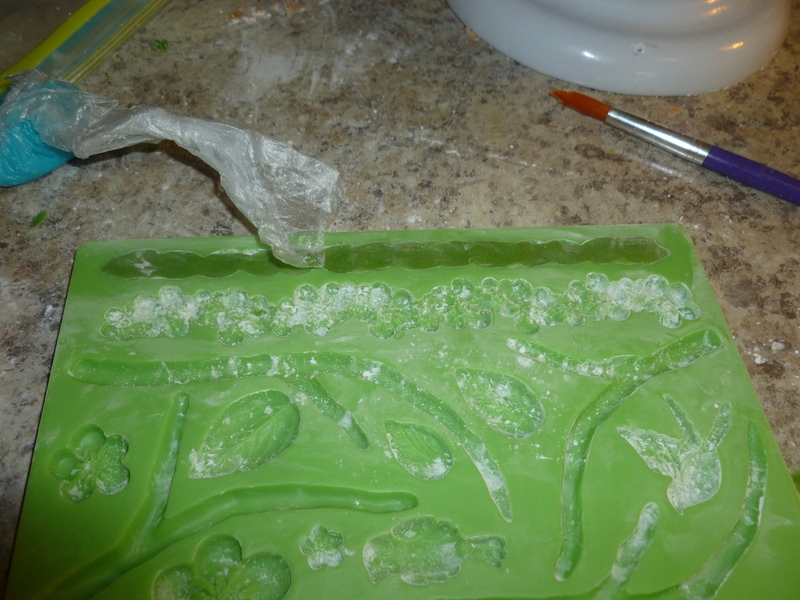 I switched to having my mold hardly dusted at all and carefully pulled the leaves from the mold. I applied it to the bottom of the cake with water and a paint brush. It looked good at this point, but after going to the grocery store and thinking about it, I decided I had to try adding some petal dust to make the flowers pop more. It just looked too plain to me. Excuse my pictures from this point! I need an assistant. I wasn’t going to decorate the cake board with a colored ribbon because I couldn’t decide on a color, but went with light pink anyway. I used a 12″ cake board, so doing a little math (3.14 x 12 = 37.6), I cut my ribbon to 38″ and measured with a fabric ruler. Then, all you do is apply with hot glue. 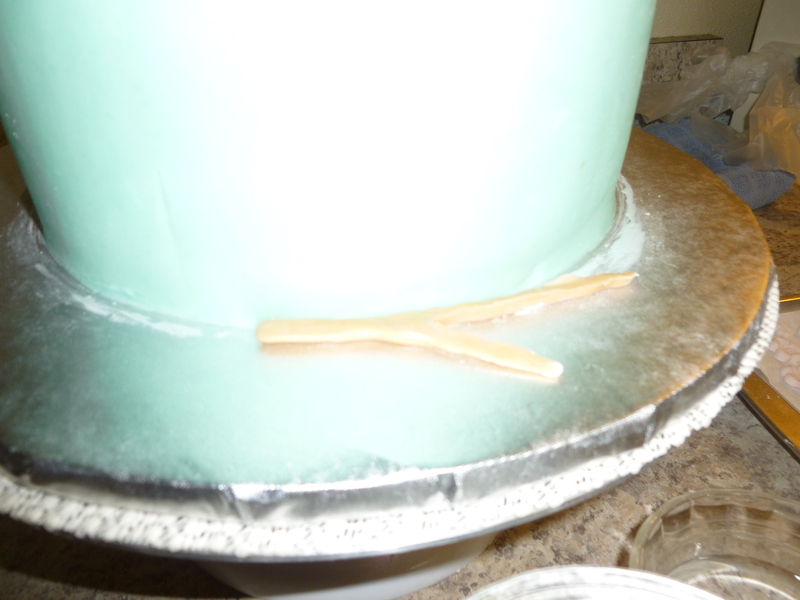 3/4″ ribbon is perfect for my cake boards. I used to put on the ribbon BEFORE I started the cake, but deemed that it is a lot smarter to do it afterwards. This way, it doesn’t get dirty with icing, corn starch, powdered sugar, etc. When it finally came to eating the cake on Easter Sunday, I wasn’t too impressed with the recipe. 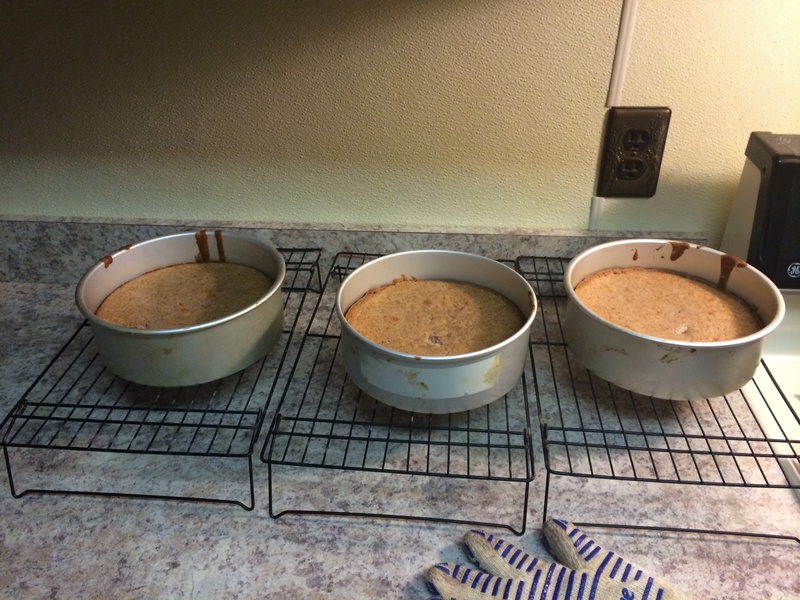 Now I MAY have used too much cake flour because different websites call for different weights. Who knows. Either way, other people LOVED the taste and said it was delicious. Cake is so subjective sometimes. My sister loved it and took a huge hunk home. I took half of it to my in-laws and my husband’s aunt, who loves strawberry cake, also thought it was delicious. Maybe I just prefer chocolate cake and pound cake! If you have any questions, because I know this was a long and drawn-out post, just let me know! 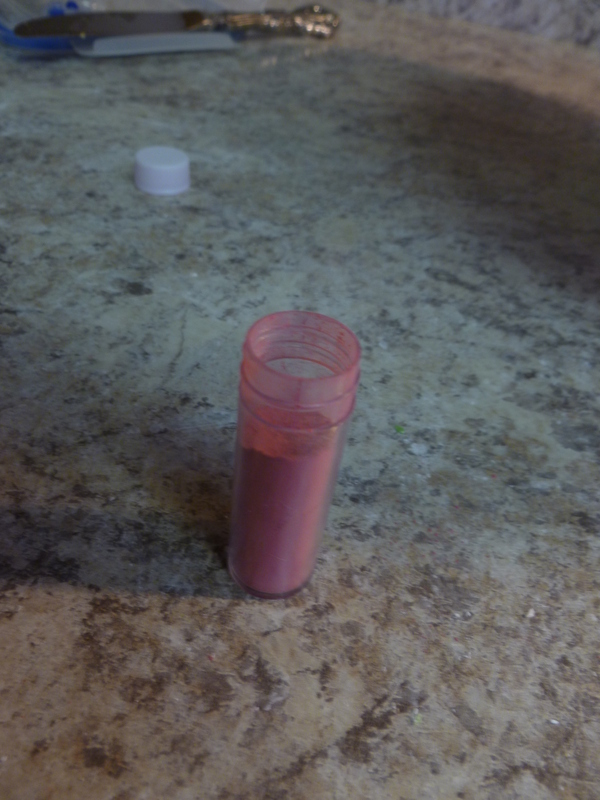 One more thing … BEFORE & AFTER PETAL DUST SIDE-BY-SIDE. I think it made a big difference!